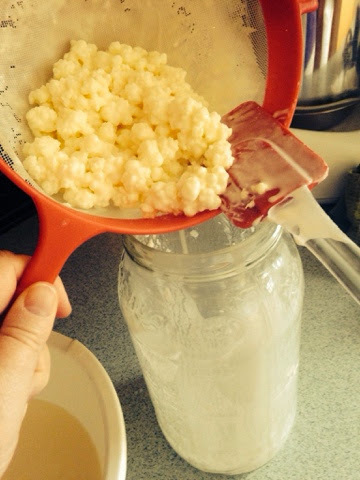 Dairy Kefir is a white, milky substance that looks similar to cottage cheese. Dr. Donna Gates and Dr. Natasha Campbell-McBride work with autistic children in the eastern United States and in England. They are having great success decreasing symptoms of autism and many other psychological ailments by using fermented foods. Check out this exciting video where they talk about the success they are having, the importance of beneficial bacteria in the intestinal tract, and how fermented foods can replenish the gut lining. Although they do not use the exact dairy kefir I have described, it nonetheless has very similar properties, and will have effects similar to the fermented foods they talk about in the video. Since a healthy intestinal tract increases digestion, kefir greatly influences the movement of the bowels, decreasing constipation and stomach upset. It has been known to help with Crohn’s disease, constipation, parasites and other common digestive ailments. You can also use the biofilm (the white residue) that accumulates on the inside of the jar of the kefir milk for any kind of rash on the skin and yeast infections. It is wonderful for diaper rash. Kefir milk can be used in many baking recipes where milk or water is called for. It can be used in pancakes, biscuits, and cakes. (For pancakes, I use “kefir milk” for half the liquid called for in the recipe. For biscuits, I use all kefir milk.) One of the best things about the Kefir grains is that it breaks down the harmful substances in milk and wheat that make them hard to digest for many people. (I have heard from one mother that this applies to those who are gluten intolerant, but not to those who have Celiac disease). Kefir bread can be made by soaking ground whole wheat flour in Kefir milk for 24 hours before baking. The kefir replaces the water and the yeast, and makes sourdough-like bread. In a glass or ceramic jar, add milk to the kefir grains. The ratio is roughly ¼ cup kefir grains to 2 cups of milk. (This is not a set amount. You can experiment with this to your liking.) Kefir likes raw milk best. The next best is organic milk, but you can also use 2% or whole milk that is pasteurized from the grocery store. Let this mixture sit out on the cupboard for 24-48 hours. The longer you let it sit, the more fermented it will be. After 24-48 hours, pour the mixture through a plastic strainer. (If you can find one with very small holes, this is best, but if you don’t have that, you can use a colander used for straining noodles). Do not use a metal strainer, or any kind of metal on the kefir. It decreases its potency. If you forget and the kefir comes in contact with metal, it’s not the end of the kefir, it’s just not as potent. 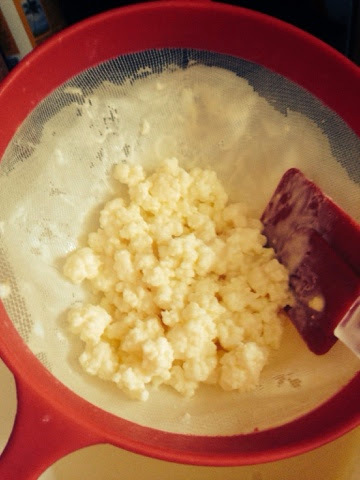 After straining the kefir mix, the “kefir milk” will be in the bowl beneath the strainer, and the kefir grains will remain in the strainer. Add the kefir grains back into the original jar. You can rinse the jar out before re-using it, but you don’t have to. You can simply add the kefir grains back in. In the beginning, I recommend NOT rinsing the jar, because you are establishing your culture, and it does better when the jar is not rinsed. Remember, whatever is in there is not going bad, because there are good bacteria and yeasts to keep it from going “bad”. If you are going to be gone for more than 2-3 days, put your jar with the kefir grains in the fridge. It will last up to 10 days in the fridge. 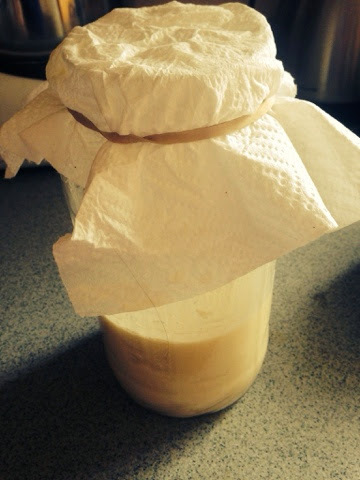 Upon returning, strain out the kefir milk and discard. Start with a fresh batch of milk out on the counter top, and start the process of fermentation all over again. If you are going to be gone for longer than 10 days, you should find someone that will take care of your kefir for you while you are gone. There is also another kind of Kefir called Water Kefir which uses sugar water as its nourishment instead of dairy milk. It is just as beneficial as far as the gut flora, and it tastes a lot better than dairy kefir. Downside: It does not build up the biofilm on the side of the jar that is medicinal for skin rashes and infections. My new neighbor explained that he had been bitten by a tick when he was in his early twenties, and for forty years he had been suffering with an itchy, blotchy red rash between the knee and the ankle of his leg. He said he had tried everything. Creams, lotions, medications - everything the doctors prescribed or suggested, and everything that alternative medicine practitioners had suggested. Some things had helped for awhile, but the itch and the rash had always returned within a short time (the longest it was gone was 4 months before it returned). I suggested he try the "kefir paste", as I like to call it, which is the white residue, or biofilm, that builds up on the side of the jar of kefir milk that you keep in the fridge. I scraped off some of this biofilm and gave it to him in a baggie. His wife put it on him in my kitchen, and he was able to handle it for about 5 minutes. After that it began to itch so bad he couldn't stand it, so he rinsed it off with a wet cloth. His wife was persistent, however, and she took some kefir grains home and started making her own, and she would apply the kefir paste on him every day. He was able to tolerate it for longer and longer periods of time. After a few applications, he didn't need to wash it off anymore. Within days he could see a difference. After a month of applying the kefir paste every day, the rash, the itch, the blotchy appearance - it was all gone. At the last report it has been three and half years, and it has not returned. NOTE: I just realized that from our pictures, you can plainly see that we do not have the recommended 2 cups of milk added per 1/4 cup of Kefir grains! We like our kefir strong, and we have so much that we are not looking to "grow" it, per se, so we do not add as much milk as the ratio mentioned here. These statements have not been evaluated by the Food and Drug Administration. The products mentioned in this blog are not intended to diagnose, treat, cure, or prevent any disease.